A member of the sumac family, the Mangifera genus contains about 8-12 species. Mangoes are the most prominent member of the genus. Lifespan: Up to 300 productive years. Mature Size: 30-120' high and 10-30' wide. Flowers: White to pink, five petals, small, clustered at the end of shoots, fragrant. Bloom: Late fall or winter, depending on cultivar and microclimate. Mature trees tend to alternate between heavy bloom years and light bloom years. Pruning excess blooms in heavy years may reduce this alternation. Years before fruiting: 5-8 from seed, 3-4 with grafted rootstock. Fruit: Large, with yellow, orange, red, or green skin, ripe pulp pale yellow to orange, sweet. The fruit contains a single flat, oblong pit, covered with fibers, which does not separate easily from the pulp. Months for fruit to ripen: 3-6. 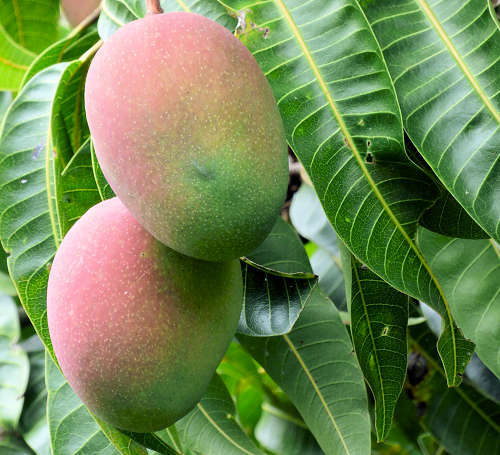 Mangoes are ripe when they turn color, when the flower end widens, or when they start to fall from the tree. Ripe mangoes will snap off the stem with a slight pull. Mangoes continue to ripen after being picked, even when green. Some mango cultivars are best harvested green and ripened indoors to produce the best flavor. Storage after harvest: Mangoes ripen in 3-8 days after harvest. They can be refrigerated up to 2 weeks, only after they are ripe, or chill injury results. Leaves: Lance-shaped, orange-pink when young, rapidly changing to a dark glossy red, then dark green with maturity. Roots: This tree has a taproot growing up to 20' deep, and wide surface feeder roots. It is often grafted onto a cold-hardy rootstock. 'Rosigold' – Southeast Asia, small tree, March-June harvest. Wildlife: Attracts flies, wasps, and fruit bats, rarely bees. Toxic / Danger: All parts, including fruit skin, can cause dermatitis and anaphylaxis in susceptible individuals. Peeled fruit is safe to eat. Avoid skin contact with sap when picking fruit. Origin: Eastern India and Myanmar. Cultivated for more than 4000 years. USDA hardiness zones: 9b-15. Young trees are killed below 30°F, older trees are killed below 25°F. Flowers and small fruit are heavily damaged below 40°F. Low wattage incandescent bulbs and frost cloth can be used to protect the tree from winter freezes. Remove the frost cloth when the temperature gets above freezing. Heat tolerant: Slightly. Leaves may turn yellow at high temperatures but green up in cooler weather. This tree needs part shade all day in the hottest six months of the year. Sun: In regions with hot summers, avoid reflected heat and provide 50% shade all day. Water after becoming established: Every two days in the hottest part of summer to every two weeks in winter. Soil: Well drained, deep, low to moderate in organic content, pH 5.6-7.5 (acidic to neutral). Fertilize: Aged compost every other month mid-winter to mid-summer. Avoid chemical fertilizers. Micronutrients for citrus trees can be used at half the recommended amount. Fish emulsion can also be used for micronutrients. Mulch: Spread 2" of aged compost under the canopy, especially at the drip line, and two feet away from the trunk. Planting: In regions with the possibility of winter freezes, position the tree in the hottest part of the yard where cold air does not accumulate. Plant on top of a mound if necessary to ensure proper soil drainage. Mango trees do not tolerate flooding. Some dwarf cultivars can be grown in containers and/or in greenhouses. Place the tree far enough away from any structure to accommodate the tree's mature size. Prune: Trim to shape in late winter. Wear gloves to avoid skin contact with sap. Litter: Low. Do not burn clippings or litter because the sap is poisonous. Propagation: Mangoes are usually grafted onto hardy, and dwarfing, rootstock. They can be grown from seed, although seeds do not necessarily breed true. Mango seeds do not survive freezing or drying. Uses: Ornamental, shade, edible fruit. Grocery store mango varieties are not the best tasting, just the best for transportation and storage.